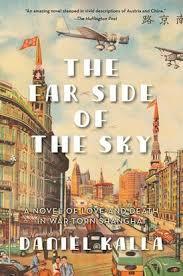 Daniel Kalla’s The Far Side of the Sky was a hard read for me. Not for any wrong-doing on the author’s part. If anything, his talent in immersing me in 1930s Germany and Shanghai is to blame. At its heart, The Far Side of the Sky is a romance. It’s also a history lesson; one so painful, especially in today’s political climate, that I had to put the book down a couple of chapters in. A few of weeks later, I forced myself to pick it up again, rationalizing that if the people who actually lived the atrocities of World War II Nazi Germany could find strength to go on—and some, survive—I could summon strength to read a fictional story of the horrors—and triumphs—Jewish people experienced. Franz and Sunny’s journey to happy-ever-after is riddled with emotional, social, political, and ethnic obstacles, life-threatening and life-ending issues that almost succeed in killing their relationship, before it has a chance to begin. Fortunately, Franz proves a strong and honourable man. A man strong enough to sacrifice personal happiness—even his life—to protect others, including Sunny. Sunny is much like Franz, always putting herself in harm’s way for the benefit of others. Together, they save lives, including their own, and through their trials and heartaches they discover that the future is no guarantee, but love is. I’m glad I persevered and read my way to The End, to when love and kindness, and integrity and honour triumph over hate, bigotry, and fear, just as it did in 1945 when Nazi Germany surrendered to forces of good. 4.5 stars.